Each large #10 can contains 26 servings of Rancher's Cut Freeze Dried, Cooked White Meat Chicken. Honeyville's Rancher's Cut Freeze Dried, Cooked White Meat Chicken is a great addition to a well rounded food storage plan. With the prevalence of animal proteins in most daily diets as the main source of proteins, it's important not to forget this staple when planning for the unexpected. 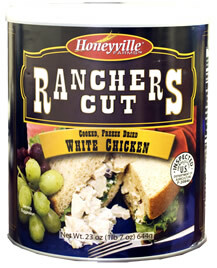 Honeyville's Rancher's Cut Freeze Dried Chicken is made from 100% North American poultry. Our chicken is diced and cooked. It is then freeze dried in a process where 98% of the moisture is removed, leaving great tasting chicken with excellent shelf life. Honeyville Freeze Dried Chicken contains no additives or preservatives and is easy to prepare. Every Honeyville Freeze Dried Meat is inspected by the USDA for wholesomeness. Ingredients: Cooked White Chicken Meat. Directions: Simply add 1 cup of boiling water to 1/2 cup of Freeze Dried Chicken. Stir once, cover and let stand for 5 to 7 minutes. Drain off excess water and use the chicken as you would use fresh chicken. Yields 1/2 cup of chicken. Shelf Life: 10 to 15 years in the sealed #10 can (with included oxygen absorber) under ideal storage conditions (a cool, dry place). Note: After opening, freeze dried meat should used within 1 month if refrigerated, one week if not.